Here she is. Got a fantastic deal on it. A little leak out of the bolt, but Im working on it, no louder than a small macroline leak. Still shoots, and very nice at that. Looks good, what're the other guns? I'd get a black rail, black fittings, and black macro. But besides that it looks nice. A friend had one and his shot really smooth. 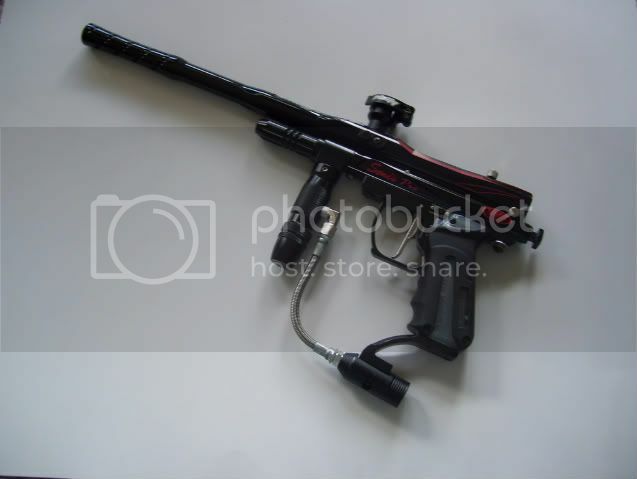 bigred- Getting a PGP2 tomorrow I think, then getting a 98 RF Sniper 2 this week. Still got a couple other guns Id like to add to my little collection soon though. So I didnt feel like making a new thread, so here is my new PGP2. Already got the black paint off, but haven't used any Brasso yet. Works perfectly. Not pictured but just got some PMI soft grips for it. Oh my! So much nicer than the stock grips. Pic.